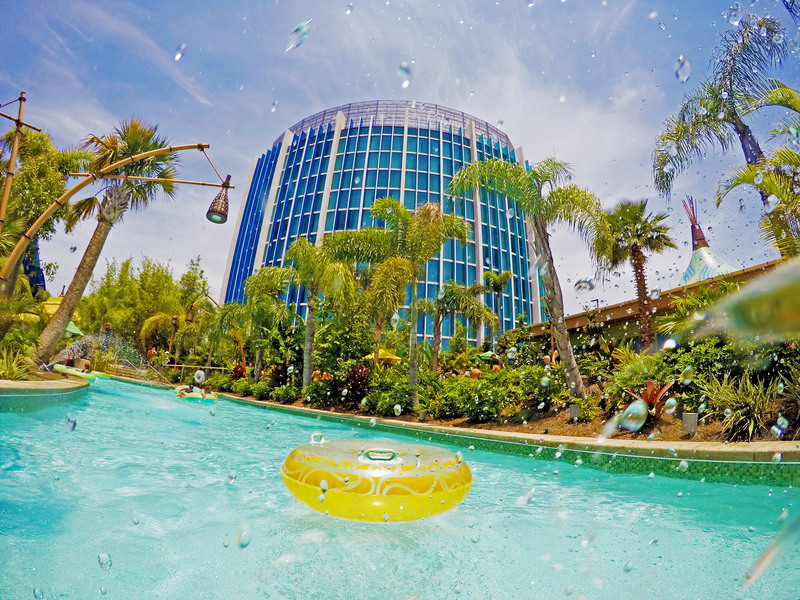 We love a good theme park packed with thrill rides, but give us sunny, 75, and a water park any day! 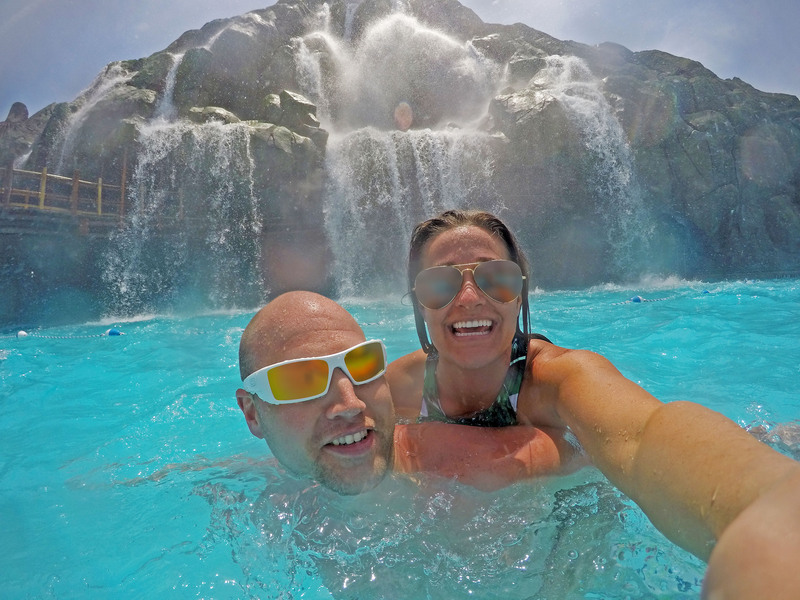 Our travels have taken us to some of the most A-Mazingly-themed water parks, from Atlantis Resort in the Bahamas to of course Typhoon Lagoon and Blizzard Beach both in Orlando, Florida. Travel with us below on our first ever visit to Universal Orlando Resort’s Volcano Bay Water Theme Park. Remember to subscribe to our YouTube Channel for access to our latest vlogs! If you like what you see, please give our video a thumbs up! When we heard Orlando was adding another water park to its already impressive list of attractions, we were stoked. For years, the only thing missing at Universal Orlando Resort for us was honestly a quality water park. Believe us when we say, this is so much more than a water park because we truly had the best BAY ever during our most recent visit! Universal Orlando’s first Water “Theme” Park, Volcano Bay, opened in May of 2017 and with over twenty water slides, this literal watering hole may just be our new favorite place. Universal Orlando Resort guests receive early park admission and complimentary shuttle transportation to and from Volcano Bay. This extra hour prior to park opening is invaluable, and if you’re looking to maximize your time at Volcano Bay, you may also want to procure a reservation at Universal Orlando’s Cabana Bay Resort, Universal’s value-priced option, which is adjacent to Volcano Bay Water Park and affords its guests easy access to come and go as they please. Travel Tip: One trick that worked for us when arriving (during early park admission) was to head left as we entered the park (or clockwise) to grab our locker at the Wave Village Lockers East while the remainder of the guests headed right (counter clockwise) towards the Wave Village Lockers West. The walk from the main entrance to the East Lockers is much shorter, but perhaps not as centrally located, than the walk from the entrance to the West Lockers. Day-guests who are staying off-site can access Volcano Bay by parking for a $20.00 USD fee at Universal CityWalk’s parking garage, and then take advantage of the complimentary shuttle which drops guests off at the Park’s security gate. After passing through security, guests will pass through a series of ramps or stairways that eventually lead to the Park’s main gate. After admission is granted, Universal Staff will arm all Volcano Bay guests with Tapu Tapu wearables. The team at Universal creative constructed an incredibly immersive experience thanks to Volcano Bay’s lush tropical landscape that transports guests to an undiscovered Polynesian island. At just around one year old, Volcano Bay feels as if it’s been a part of Universal Orlando since the very beginning. Nothing about the park feels forced, incomplete, or out of place. The Agricultural Department did an excellent job planting mature flowers, trees, and shrubs in order to make the landscape look complete in contrast to most new venues who often plant new growth (saplings as opposed to mature plant life) which can take years to mature and fill out a space as the original designers intended. Even the shimmering towers of Cabana Bay fit in nicely within the surrounding landscape as if to magnify the beauty of Orlando’s mostly sunny blue skies. It’s hard to believe when you’re inside the Water Theme Park that you are in reality so close to the interstate (until you start climbing the seemingly never-ending stairs to one of their thrilling tube slides). Volcano Bay centers around the picturesque Krakatau Volcano where guests can relax beach side, catch a wave, or snap a few Instagram-worthy shots of the Park’s iconic volcano. At a height of 200 feet and taller than Cinderella’s Castle at Walt Disney World’s Magic Kingdom, Krakatau is one park icon you just have to see to believe. Krakatau looks good from any angle or vantage point throughout the park. Whether you’re riding a slide or catching current in the Fearless River, Krakatau’s impressive stature dominates the Volcano Bay landscape. During the day, the volcano vibe is a tropical, laid-back paradise. Thanks to its ample beachfront seating options, Waturi Beach is the perfect spot to keep cool with a cocktail and take in the Florida sunshine. At night, Krakatau’s feature waterfall transforms into a trail of fiery lava flow which appears to be erupting from the volcano itself. The price for one day admission to Volcano Bay is $67/ USD per adult and $62/USD per child. During our stay, we purchased a promotional three-day Universal Orlando park hopper which included two days free – totaling five days as a part of a promotion that was occurring at the time. Be on the lookout for deals during your dates of stay, and sign up for Universal Orlando Resort’s e-mail blasts which include announcements of upcoming deals and promotions. Reserved Seating is available throughout the Park which includes two sun loungers, a shaded canopy, and a personal locker to use throughout your stay. One of the perks of reserving seating is the wait staffs who service these areas. Reserved seating guests benefit from lounge-side waiters and waitresses who serve food and drink on-demand. The seating prices vary, but the most affordable options start at $29.99 USD per day plus tax. Private Cabanas are available to rent in one (up to six guests) or two story (up to sixteen guests) options which are perfect for larger families. Starting at $159.99/USD per day plus tax for a single or starting at $299.99/USD per day plus tax for a double “Family Suite”, guests can choose between upper or lower level cabanas. Cabana rentals include sun loungers, a mini-fridge, bottled water, towels and a private locker. Wait staff are also available to serve cabana guests food and drink which will be delivered right to your cabana. Please note, the above-listed prices do not include tax. Attention Vloggers: If you’re looking to capture every minute of your day at The Bay on film, think again. When the park first opened in May of 2017, the on-ride film policy was rather lackadaisical. However, this is no longer the case. We certainly understand Volcano Bay made this decision for safety reasons, and we couldn’t agree more that safety is the most important thing when it comes to theme parks. We are very happy to see that Universal Orlando Resort is putting their guests safety first. 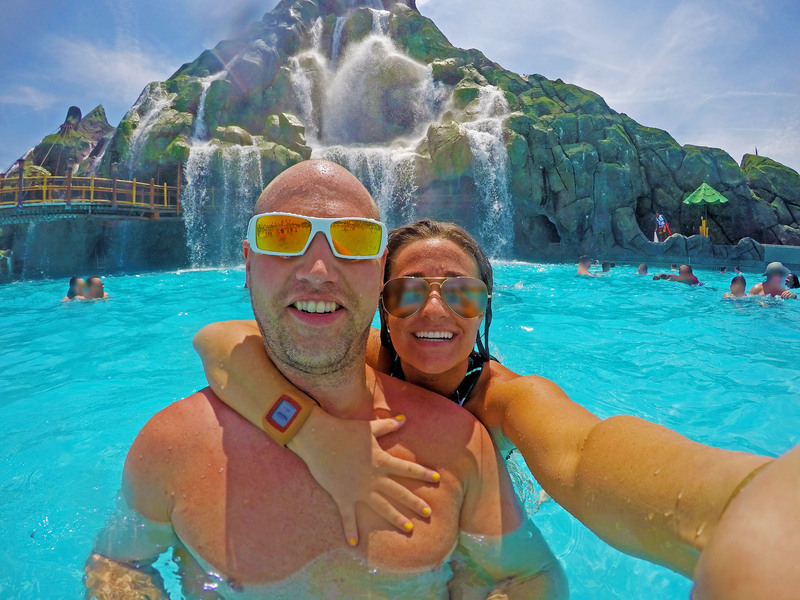 If you are looking to film some of your adventures at Volcano Bay, there are a few Volcano Bay attractions that allow filming such as the TeAwa Fearless River, Waturi Beach, Kopiko Wai Winding River, Tot Tiki Reef, Runamukka Reef, Puka Uli Lagoon, and The Reef. Ko’kiri Body Plunge is a trap door slide where riders enter an enclosed capsule one at a time which sends them 125 feet down Krakatau Volcano and through the wave pool at lightning speed. This is, in our opinion, one of the most intense water park rides we’ve ever experienced, and it’s hands-down the most thrilling ride at Volcano Bay. If you experience any anxiety issues including a fear of heights or enclosed spaces, we suggest you skip this one. Kala & Tai Nui Serpentine Body Slides are two additional trap door slides where guests are sent in pairs through a winding set of two tube slides down Krakatau Volcano. Again, if you suffer from anxiety or enclosed spaces – these slides may not be for you. Honu Ika Moana is a set of two twisting, thrilling, and downright INSANE multi-rider raft slides that seat between 2 to 5 riders and are not for the faint of heart. If you live for water park thrills, these are the slides you came for, but be prepared for long lines if you don’t hit this one first thing in the morning. Maku Puihi is a multi-rider saucer slide that can be seen from Interstate 4 and a few other vantage points throughout downtown Orlando. These two enclosed slides seat anywhere from two to six riders for a spin through a few zero-gravity curves, but hold on tight because this is one wild ride! If you’re the largest person in the raft, be prepared to spend the duration of the ride backwards which can be both thrilling and downright terrifying at the same time. We really enjoyed this slide, especially the first drop! Ohyah & Ohno are two twisting drop body slides. Ohyah is an enclosed serpentine tube slide which sends riders lying on their backs through twists and turns before ending with a four foot drop into ten feet of the misty water below. Ohno is an open serpentine slide which is very similar to Ohyah, but instead ends with a six foot drop into ten feet of water below. We highly recommend that only strong swimmers attempt this slide as the g-force curves and sudden drop at the end can be very disorienting which can take its toll on even the strongest of swimmers. If you’re unsure of whether or not these slides are for you, be sure to scope out the drop point before getting in line so you know what you are in for. Punga Racers is a mat slide that allows riders to race through curves and caves in groups of four down Krakatau Volcano. Taniwha Tubes are four winding single & double-rider raft slides. Taniwha includes two enclosed slides and two open slides that transport riders through twisting turns while drenching them with waterfalls throughout. Krakatau Aqua Coaster is a unique and innovative addition to the world of water park attractions. The scenic ride utilizes magnets to guide riders seated in a two to four-person canoe up and down high speed hills and through the exhilarating twists and turns of the park’s iconic volcano, all while being showered by the rushing ice cold waters of Krakatau. This ride is fan-freakin-tastic, and we literally couldn’t get enough of it. We rode this over-and-over (…and-over) again during our visit to Volcano Bay, and it will be the first ride we hit on our next visit – for sure! However, be warned – the waters are some of the coldest in the park. This may be refreshing on a hot & humid Orlando summer day, but in the spring and early fall, it was a real shocker when we were drenched by such cold waters! A little known fact is that the waters must maintain a certain temperature (ice cold) in order for the ride’s magnetic system to function properly. The reason we note the ice cold temps is that most of the other rides and attractions in Volcano Bay offered significantly warmer temps (almost like bath water). Taniwha Tubes & the Krakatau Aqua Coaster were two of our most favorite rides at Volcano Bay. If you couldn’t tell, both of these rides were a BIG hit with us. We actually rode all four Taniwha Tube slides and took multiple trips on the Krakatau Aqua Coaster during our visit (too many to count). Taniwha may not be for everyone, but the Krakatau Aqua Coaster is fun for the whole family – and one that should not be missed on any trip to Volcano Bay Water Theme Park. Don’t forget to bring your little ones because The Bay isn’t just a place for adults! Kids can have fun at Volcano Bay Water Theme Park too! Volcano Bay does a nice job of spreading out the attractions for its guests who may be too small to ride some of its more intense attractions. If you brought your little ones to Volcano Bay, we’d love to hear what they loved most! TeAwa The Fearless River is a lazy-river on steroids. Riders strap in to complimentary life vests provided at each of the river’s two entry-points and float their cares away along this scenic and rapid-filled river ride through The Park’s Rainforest Village. This tube-less river is a great way to keep cool and see Volcano Bay from a whole different angle. Waturi Beach is Volcano Bay’s signature water feature where guests can ride the rocking waves of Waturi’s warm turquoise waters. This wave pool truly puts us in a tropical state of mind, and with a cool cocktail in hand – we’re officially on island time! Kopiko Wai Winding River is the lazy river you’ve been looking for. Grab yourself a tube from one of the River’s two entry points, and take a slow ride through The Park’s scenic River Village. Enjoy the calm winding waters of Kopilo Wai from your tropical tube, but watch out for Tapu-Tapu touch points were bystanders may take advantage of a few spray guns to drench you during your journey. It’s probably the most relaxing space in all of Volcano Bay, and we highly recommend you don’t miss this one at night! If the slides aren’t for you, The Reef is the Park’s relaxing wave-free pool that offers views of Krakatau and some of the Park’s most popular slides. While lounging in The Reef, be sure to pay close attention to the far wall of this infinity pool where the riders of Ko’kiri Body Plunge pass underwater at rapid speeds. If Ko’kiri is not for you, this is the perfect waiting area to pass the time while other members of your party attempt the thrilling ride. Puka Uli Lagoon is a super chill zero-entry pool located on the beach near the Ohyah & Ohno slides. Sun loungers surround the pool where you can wait for the rest of your group to ride Ohyah & Ohno or just take an afternoon of Florida sunshine. You’re probably asking what it’s like to experience Volcano Bay in comparison to some of the other water parks we’ve visited. We have to say, the experience is unlike anything we’ve ever encountered before. Let’s face it; we spend the majority of our lives waiting. At the grocery store, the gas station, the copier at work, in traffic, on hold with customer service, for tables at restaurants, to grab a drink at the bar, and most importantly – at theme parks. Waiting is a good chunk of our time on this earth, so why not maximize those precious vacation moments when given the opportunity? Universal Orlando does just that with their newest gadget, Tapu-Tapu. Tapu-Tapu’s are complimentary wearable technology that guests receive immediately upon admission. Similar to an Apple Watch or FitBit, but a little more bulky in size, these waterproof devices allow guests the ability to reserve a spot in line for the Park’s attractions without committing to standing in one place for forty-five-plus minutes. Volcano Bay’s state-of-the-art queue-less ride system is definitely what attracted us to Volcano Bay. Universal Orlando’s Tapu-Tapu is a water park game changer. The technology is completely different than Walt Disney World’s Fast Pass+ system in that it allows guests the ability to create a more convenient and relaxing vacation experience. Tapu-Tapu is an on-site feature. It does not require guests too pre-plan every moment of their trip 90+ days in advance in contrast to Fast Pass+. For us, this is the major turnoff for Walt Disney World’s Fast Pass+ system as it does not afford us the spontaneity that we so enjoy while on vacation. Tapu-Tapus are distributed at Park entrance to all guests and included with the price of admission. They are required to ride the water rides so if you’re opposed to sporting a Tapu-Tapu, know that you will be beach bound (which might not necessarily be a bad thing). After strapping on your Tapu-Tapu, head to any attraction and tap your Tapu-Tapu on that attraction’s corresponding totem pole. After a successful tap, your Tapu-Tapu will queue up that attraction’s wait time. From there, head to the beach, take a ride in the lazy river, grab a cocktail, or a bite to eat and enjoy yourself (reminder: you’re on vacation) until your Tapu-Tapu tells you that you’re ready to ride – the possibilities are endless. Your Tapu-Tapu waits in a virtual line for you. Just know that riders can only queue up one ride at a time. We will honestly say though that we were hesitant when we first heard of the Tapu-Tapu technology since we’re not fans of bulky wearable tech. We do own a few wearable pieces, but when we’re on vacation… we prefer to leave our devices at home. The nice thing about Tapu-Tapu is it serves its purpose. It’s not a multitasking tool that interrupts our day in paradise with text messages, phone calls, and e-mails. It still allows the user to be out-of-office. Another reason Tapu-Tapu stands out from Fast Pass+ is that it serves as a multi-use tool throughout the park. With a Tapu-Tapu, guests have the ability to snap a quick pick in front of an artificial intelligence-based photospot, open your locker rental (no more annoying key to carry) as well as paying for lockers, merch, food, and drinks and interacting with the Park’s add on features such as water cannons and Janine’s favorite – talking tikis. We love the idea of enjoying the parks without carrying our room key, wallet, or any other unnecessary devices. Although the device does countdown the rider’s time left in line, it does not offer any means of time keeping. Obviously, time is not a priority when you’re on vacation – but we prefer to have some idea of the time (in case we have dinning reservations). An added watch feature to the Tapu-Tapu would be a fantastic one. The design is a bit bulky considering its limited features. Our Apple Watches and Fitbits can do so much more than the Tapu-Tapu and they’re a quarter of its size. If you have a small wrist (children and petite adults), the Tapu-Tapu may be uncomfortable for you. Also, those with larger wrists find it extremely difficult to keep their Tapu-Tapu’s intact while riding the twists and turns of the park’s thrilling water slides. Perhaps our biggest complaint is that the virtual-queue system is not yet perfect. While waiting in our virtual queue for Ko’kiri Body Plunge, via the warm waters of The Reef pool, our Tapu-Tapu buzzed us reading “Ride Now” as soon as we entered the pool’s waters. The wait time originally said “30 Min” just a few moments ago. What we did not realize was that our virtual spot in line suddenly became “Ride Now” without warning. Fortunately, we were close by and it was an easy change. Kohola Reef Restaurant is the first restaurant guests pass as they enter the Park. Their menu includes everything from pulled pork to burgers and chicken. Whakawaiwai Eats has a selection of pizzas and macaroni and cheese. Bambu is a quick-service option that offers traditional theme park faire like hot dogs and burgers. The Feasting Frog is one of our favorites as it’s not your typical theme park menu. The menu is light, and the food options are not only quick but also delicious. The Frog offers quick bites like tacos, bowls, chips & guac where guests order from a small frog-themed quick-service hut and dine at picnic tables near the Kunuku Boat Bar just a short walk from the entry for Krakatau Aqua Coaster. We enjoyed feasting on our tacos, chips & guac, and we highly recommend you try this spot on your first or next trip to Volcano Bay. If thrilling water slides aren’t for you, grab yourself a cool cocktail from one of the many Volcano Bay Bars and enjoy the sun and sand of Waturi Beach. We tried a number of specialty drinks during our time at The Bay, and they were all delicious. However, if we had to pick a favorite – it would be Vol’s Fire Punch. Nothing beats the Florida heat like a refreshing cocktail from one of Volcano Bay’s two themed-bars. However, if you’re going to hit the bar, do it early. As the days go on and Volcano Bay becomes more busy, so do the bars! Kunuku Boat Bar offers both alcoholic and non-alcoholic beverages. Dancing Dragons Boat Bar is the perfect spot to refresh yourself on those hot Florida afternoons. Grab yourself a tropical beverage or a frozen cocktail and take in the views of Krakatau. Both alcoholic and non-alcoholic drinks can be served either in a standard cocktail glass or a souvenir cup which can be purchased for an additional fee. We purchased the souvenir glasses on our most recent visit so that we could bring a little Volcano Bay home. Volcano Bay is located in Universal Orlando Resort in Orlando, Florida. The closest international airport to Volcano Bay is Orlando International Airport (MCO). From the airport, guests can rent a car or grab an Uber or Lyft for a short twenty minute commute, absent of any traffic issues. We highly recommend you stay on-site at one of Universal Orlando Resort’s five hotels for your time at Universal. Universal’s Volcano Bay is conveniently located off I-4 and easily accessed via complimentary transportation from any Universal Orlando Resort Hotel. Otherwise, you may end up spending the majority of your day stuck in traffic on I-4 regardless of how far your hotel is from your chosen destination. Under normal circumstances, the commute from most Orlando properties wouldn’t be so bad. However, the current construction climate of the surrounding Orlando area has become frustrating to say the least. After years of commuting from the Walt Disney World Resort to Universal Orlando Resort, we decided to split our stay on our last trip. This was honestly one of the best decisions we’ve made to date. If you’re planning a trip to the Orlando-area soon, we highly recommend you add a day at Universal’s Volcano Bay to your theme park itinerary. This water theme park is a great addition to the already incredible list of Orlando-area attractions. If you do head to Universal’s Volcano Bay, we hope you have the best BAY ever! Universal Orlando Resort’s Volcano Bay Water Theme Park is truly one of the best water park experiences we’ve had to date. With the introduction of a water theme park, Universal Parks & Resorts really hit one out of the park (pun intended)! We happily admit that Volcano Bay was the main reason we decided to stay at Universal Orlando Resort on this trip, after an extended hiatus. From riding the thrilling slides and eating all the tasty snacks, to relaxing in the wave pool (all without wasting our day in lines on lines on lines) we truly had the best BAY ever! Have you had the chance to experience Volcano Bay? Did we miss anything in our guide that you think our readers should know? After reading more about The Bay, are you planning a trip to The Bay on your first or next visit to Orlando? Will Volcano Bay Water Theme Park finally be the reason you visit to Universal Orlando Resort this year? We’d love to hear your tips, tricks, and future plans! Tweet us, e-mail us, or leave a note in the comments below about all the things Volcano Bay! The comments, opinions, and views set forth on this site are the reflected personal positions of the site’s creators. This site is not an affiliate of Universal Parks & Resorts or NBC Universal. The comments, opinions, and views set forth within this site are not the official positions of Universal Parks & Resorts or NBC Universal, and they do not reflect the Company’s position.